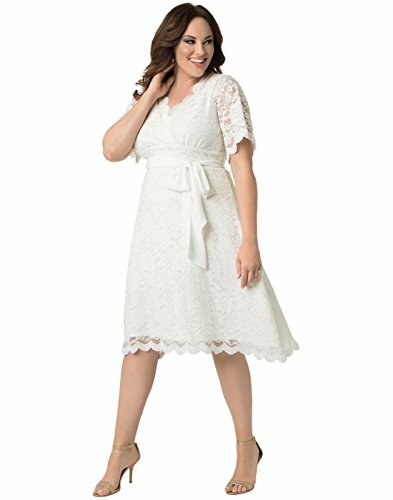 Head to the chapel in our retro-inspired, plus size Graced With Love Wedding Dress! This flirty frock features a flattering empire waist, A-line skirt and flutter sleeves that will make you feel beautiful on your big day. A detachable sash allows you to customize the dress to your liking. The delicate scalloped stretch lace contours and fits comfortably for easy movement that will make dancing so much easier. Self: 57% Nylon, 43% Rayon; Lining 100% Polyester. Dry clean only. Removable chiffon sash. Flutter sleeves measure at approximately 12". 3" set in band at empire waist. 2X waistband measures approximately 44" around, relaxed. 2X length measures approximately 46" from high point of shoulder to the longest part of the hem. Made with love in the USA.